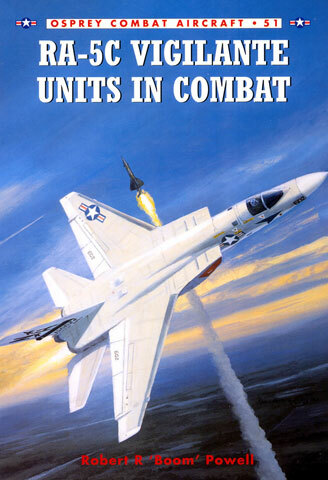 This is another excellent recent release from Osprey Publishing in their Combat Aircraft series dealing with US Navy subjects. The book has been written by Robert 'Boom' Powell who flew the Vigilante in combat during the Vietnam War. Colour profiles are by Jim Laurier. As per the title, the book covers the combat history of the North American Aviation built Vigilante or Viggie as it was affectionately known. As well as the operational history, the book also advises on the early history of the Viggie including its birth into the world as an intended nuclear weapon carrying attack aircraft and its eventual evolution as an unarmed, extremely fast reconnaissance aircraft. The book comprises six chapters, a preface, an introduction as well as nine appendices and ten pages of colour profiles. From Highway Patrol to Protective Reaction. This is a well written book by some one who experienced combat in a Viggie first hand. It provides you with the dry information of the how and why the Viggie was built as well as what it was like to fly it in combat. The book is very well illustrated with 87 sharp, clear, black white photos as well as 12 colour ones. There are also 40 colour profiles and 3 pages of line drawings to 1/108 scale. One of the profiles is of the trial camouflage schemes worn by machines of RVAH-13 flying from the USS Kitty Hawk in late 1966. The whys and the wherefores of this scheme are covered in the book. Vigilante Designations (what the number/letter systems means in terms of how each Vigilante was termed). 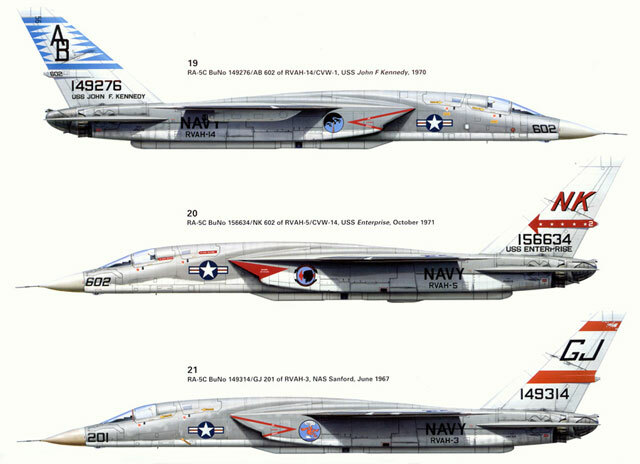 US Navy Squadrons (what the 'V' 'C' and 'VAH' mean). Homes of the Recce Community (where they were based and what they were responsible for). Surviving Vigilantes (by Bureau number and location). RVAH Squadrons (from RVAH1 through RVAH 14. Includes a description of their markings as well as their callsigns and nicknames). A list of Vigilante losses (by date, Bureau number, where/why, unit and crew). With the imminent releases of the 1/48 scale Trumpeter kit and the comprehensive Victory Production decal sheet you will want to ad this book to your collection before commencing your build. It won't help you with walk-around type references but it will give you an understanding of what it was like to fly a Viggie in combat.